The three time former Irish Order of Merit winner carded a one-under par 70 in breezy conditions at Pestana Golf Resort’s Vale da Pinta course to move into a tie for fifth with just five full cards on offer after Thursday’s final round. At two under par, McGovern is tied with Canadian Ken Tarlin on two-under par, just three strokes behind leader Magnus P Atlevi. The Swede will take a one shot lead into the final round despite carding a three over par round of 74 on Wednesday. With another eight players within four shots of the top five, the final round promises to be a tense affair and there will be a play-off for the fifth card if necessary. But he dug deep, birdied the eighth and ninth to turn in one under 34 and came home in one under 36 by following a bogey at the 11th with birdies at the 15th and 16th. As for Atlevi, he was relieved to retain the lead on a blustery day. “It was difficult today,” he said. “It’s a two club wind and that makes a big difference on this course because you’re hitting uphill and downhill on uneven lies, and this wind is so much more difficult to get near the pin. “Making par is good on days like this, so it’s completely different, and I just had a poor finish. I would have been pleased with one over par but then I three putted the last two greens so I’m feeling a bit sick right now. “I’ve been putting beautifully the first two days but today I missed a few, which is a shame, but it’s all part of the game. Hot on Atlevi’s heels on four under par are American Chris Hunsucker and England’s Gary Marks, with only three other players – Jimmy Carter of America, Canadian Ken Tarling, the winner here 12 months ago, and Ireland’s Brendan McGovern – under par after 54 holes. The best round of the day came from English amateur Brad Smith, whose three under par round of 68 moved him into the top ten on one over par, though the 50 year old was unsure he would even be able to tee up his third round. The cut was made at the end of the third round, with players within eight shots of fifth place earning spots in the final round. 34 players were inside the mark at six over par or better. 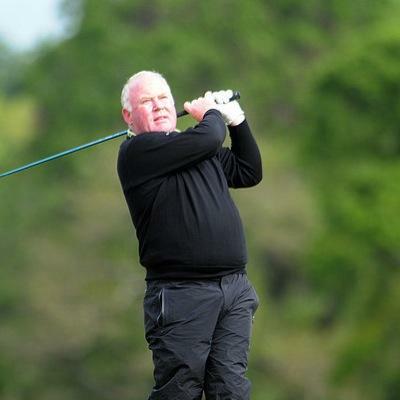 Jimmy Heggarty is tied for fifth place at the halfway stage of the European Seniors Tour Qualifying School in Portugal.